Let the reunion begin– EVERYDAY! I’m thrilled to announce that I will be joining Mike O’Meara and Kirk McEwen every morning on their radio show from 5-8:30 AM. I’ll pop in about 3 times an hour for some chit chat and a traffic update! Hope you’ll tune in too to 105.9 FM The EDGE’s The Kirk and Mike Show during your AM drive! Balloon art wasn’t the only thing poppin’ at Artisphere‘s grand opening event. Organized by Brightest Young Things and Pink Line Project …. the party themed ‘Burst!‘ was a night jam-packed with music, live entertainment and of course, amazing artwork! The talk of the night was the balloon art exhibits by Katie Balloons, who was filming at Artisphere for a new reality TV show on TLC. The nearly 2,000 creatives in attendance enjoyed pop-up performances, skate-board art and an open bar, while DJ Deep Sugar spun tracks in the ballroom. Located just outside DC in Arlignton, VA, the Artisphere officially opened it’s doors to the public on October 10. Learn more about Artisphere HERE! By Rachel DeMita, Special to OMG It was a creative’s dream party! Filled with amazing art, pleasing performances and tasty treats, art lovers gathered Sunday for a night to remember: Art Soiree’s First Anniversary Gala. Founders Sandro and Tati launched their website and announced their new project – Art Soiree Voyage – during the Gala. The two art extraordinaries were excited to share their year’s worth of successes and were pleased by the overwhelming number of attendees. Guests enjoyed the luxurious venue of DC’s Buddha Bar, while waiters treated them with Pan-Asian hors d’oeuvres including sushi and mini lettuce cups. Social delight and soothing music kept artistas on their feet all night. 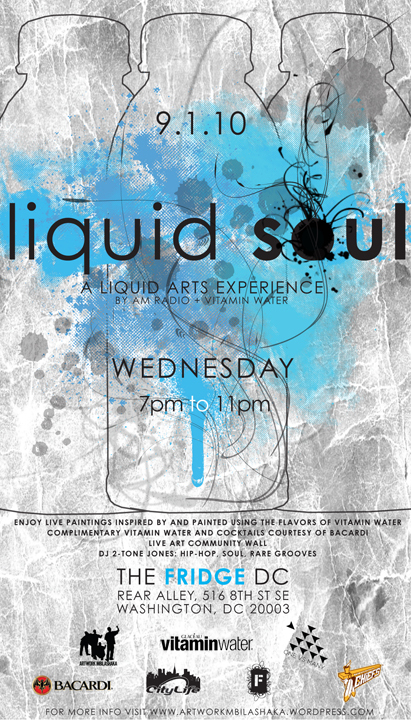 The synergy between artist and their mediums overflowed at the Liquid Soul event held at The Fridge DC in Southeast Washington. AM Radio artists created live art murals based on Vitamin Water flavors. Georgetown joins the likes of iconic fashion cities London and NYC as an official host of Fashion Night Out this year! Us host committee members held a little kick-off soiree’ at the chic Hu’s Wear on M Street. What a great space they have there! This year in addition to the heavy discounts, food and fun Cirque de Soleil is sending performers from their latest show into the streets of Georgetown to engage and entertain the crowd! The Dog Days return to Washington and hotter than the temps… the grand sidewalk sales and doggies lined up along U Street, Midcity. Shout out to Steve Fox for some great video. The Capital Club hosted a night of cocktails and carousing that would’ve made Ol’ Blue Eyes proud. Washington gents donned their best brights at the 18th Annual Summer Sinatra Soiree. The Capital Club has been around for 30 years and is known for throwing some of the best seasonal parties for young Washington!